We just wanted to check in and let you know that we have been having tons of fun seeing you all on the road and, though we’re certainly not done traveling for the year, we wanted to make sure we thanked you all for visiting the booth. For those of you that haven’t been able to see us yet, here’s what’s been going on at the shows. We were very happy to have Jessica Nigri and all the cosplay girls on hand to sign their Grimm Fairy Tales Cosplay One-Shot photo covers. The fans really seemed to enjoy the comic, which was our love letter to all you fantastic cosplayers out there. We had some other cool exclusives as well. Philadelphia is always an exciting show for us because it’s a home game. We are actually based out of the Philadelphia, so we pull out all the stops for this show. Our friends Montana, Crystal (pictured above) and Sam were dressed up as our Wonderland characters and spreading the word about our comics to the masses. 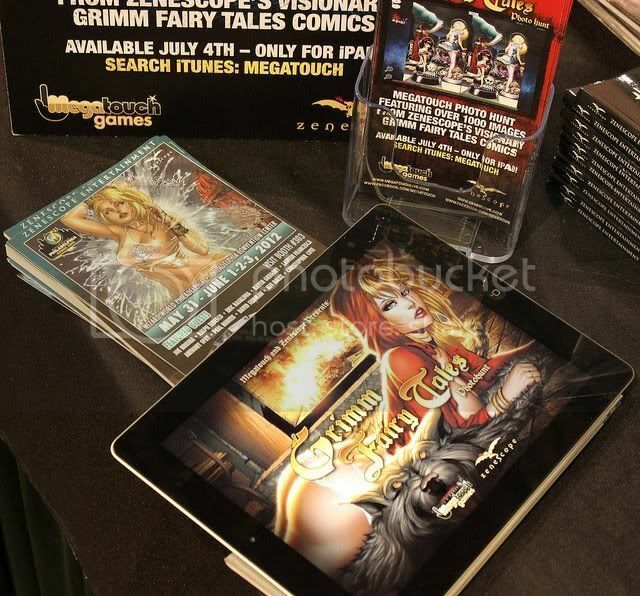 We also debuted the demo of our Grimm Fairy Tales Photohunt game, coming this July! So that’s a taste of just some of the things we have been doing on the road. We are so glad to have met so many of you and we can’t wait for more conventions!